Lying in my bed watching a video in VLC on my Note 9 brought me to my website and start writing about VLC Media Player. There is no doubt that VLC is one of the great video players for Android but what exactly VLC Media Player can offer and when you should choose VLC? The article is the ultimate review of VLC for Android. Let’s see some facts about VLC in general. It’s been over fifteen years the name of VideoLAN exists. Over 700 contributions have recorded. Over three billion downloads have been recorded. All the videos are there when you open VLC. On the top left, we have the menu button which includes options like audio, directories, history, about etc. You can search for video and audio songs by tapping on the search button. VLC has a feature of restoring the last playing video by tapping on the button next to the search bar. The second left button will help you sort out the videos by name and length. The last one is to refresh the player and change equaliser settings. The button on the bottom right is to play the first video. VLC is a simple but advanced media player. That’s why I could not stop myself writing a review of VLC for Android. The buttons show us what we can do while watching a video. The first three are invisible, and the rest can be accessed by touching anywhere on the screen. Check out: Four ways to fix Unsupported Audio-Video Codec on Android Device. You can seek by swiping left and right anywhere on the screen. You can change the brightness by swiping up and down on the left side of the screen. On Android, it requires you to give permission to change the brightness. You can change the volume by swiping left and right on the right side on the screen. The first button on the menu is lock/unlock. You can lock the screen with one touch. Of course, you will have to unlock by touching on the same button again. The second left button is for audio and subtitles. You can select the audio track, subtitles, choose a different subtitle file and download subtitles which goes online and then finds the subtitles. The third option is for pausing and resuming the video. The fourth one is packed with a wide range of options. You can set up the timer to help you stop at the right time. The second option is the playback speed. The third option helps you go anywhere in the video. Also called seek faster option. You can set the time and video will start playing from that time. The fourth button is the equaliser settings. The fifth one is called background video. It converts your video into audio so you can close VLC and do other things. The sixth button is for subtitles delay, which I find helpful when there is a difference in audio and subtitle time. The seventh one is the audio delay button. You can enable pop-up view. With that view, there will be a small video pop up on the screen. The ninth option is for repeating. If you have selected only one video, then it would only go from zero to one. The tenth one enables digital audio output. I don’t know what the option does, but it is something to try. The last button on the screen is the screen ratio. You can change the video size with this button. VLC also supports audio files. You can play any extensions. It supports the most common and the rear ones. 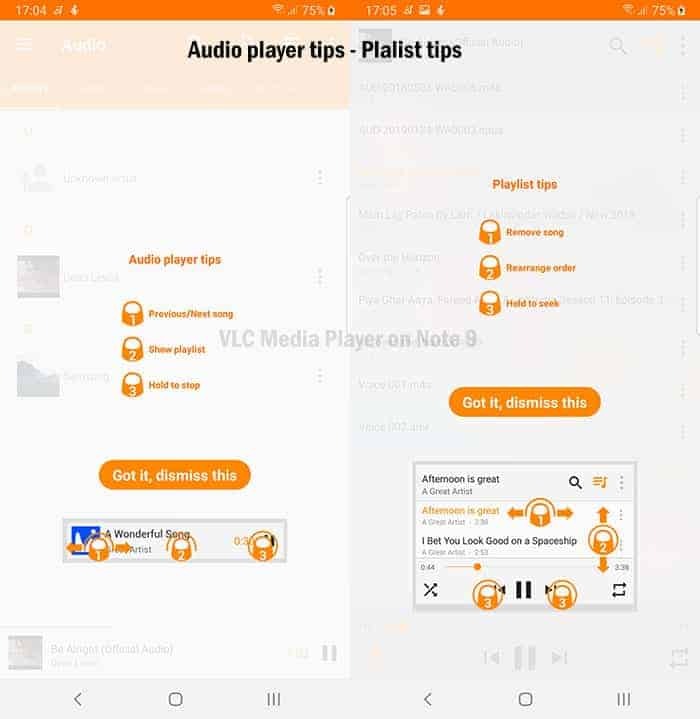 It quickly syncs the audio files in your device and then shows you tips about the audio player and playlist. The notification for VLC is like YouTube where you have to tap on the cross “x” button to remove the notification. The audio player has improved a lot, and it is my favourite player on Android so far. I hope the review for VLC Media Player helped you choose which app to download for your videos. Which app do you use for watching videos and audio songs? Please let me know in the comments below so everyone reading this article can easily choose a video player. You can also check out the app on the Google Play Store from here. Image information: The logo image is created by Nizar (the link for his twitter is in the image caption). One of the pictures is from a user on Flickr. All other images are the screenshots of VLC Media Player on Android. Please let me if you have any concerns about the images used. HERE WeGo vs Waze - Which One Should You Choose in 2019?